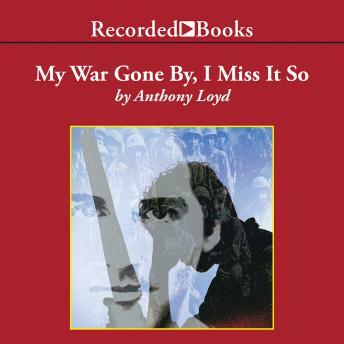 With elegance and unsparing honesty, special correspondent for The Times of London, Anthony Loyd records this harrowing account of modern war. My War Gone By, I Miss It So exposes the unspeakable terror, visceral thrill of combat, and countless lives laid waste in Europe's bloodiest conflict since World War II. Unsatisfied by a brief stint in the British army and driven by the despair of drug dependence, the author was searching for excitement when he set out for Bosnia in 1993. Nothing prepared him for the brutal life-and-death struggle he discovers there among the Serbs, Croatians, and Bosnian Muslims. As he writes of the shocking chaos, he finds a chilling purpose to his life as a journalist. Anthony Loyd has become an award-winning international reporter whose work is compared to the classics of war literature. With this powerful book, he takes an uncompromising look at the horrifying savagery and seductive power of war. British actor Steven Crossley masterfully conjures up the sights, smells, and sounds of a country being torn apart.